The Health Department plans to make its own web site easier to use and James Illig, president of the Health Commission, will soon offer a series of proposals to help diners easily see a restaurant’s health score. In the meantime, Mission Loc@l has developed a map for you to explore the restaurant scores for your zip code. It features health inspections conducted between September, 2009 and September, 2010. Click on your zip code, wait for the map to load, and the scores will appear ranked and coded. Restaurants are measured along a scale of 1-100 for safety and cleanliness. Scores are calculated based on health code violations observed during routine, unannounced restaurant inspections. Violations can be considered high-, medium- or low-health risks, and a restaurant’s score is determined by how many of each type are found. The Department of Public Health’s goal is to routinely inspect every food establishment in San Francisco twice a year. Because of the high worker turnover and budget cuts in recent years, the city has fallen far short of that target. In Mission Loc@l’s research, some restaurants hadn’t been inspected in nearly a year and a half. Health Commission president, James Illig, says that he is making this a top priority for the department moving forward. On October 12, he will propose a resolution for more transparency and oversight in the department’s operations. For information about a particular restaurant, search the Department of Public Health’s Web site. This health inspection score data was provided to Mission Loc@l by EveryBlock. 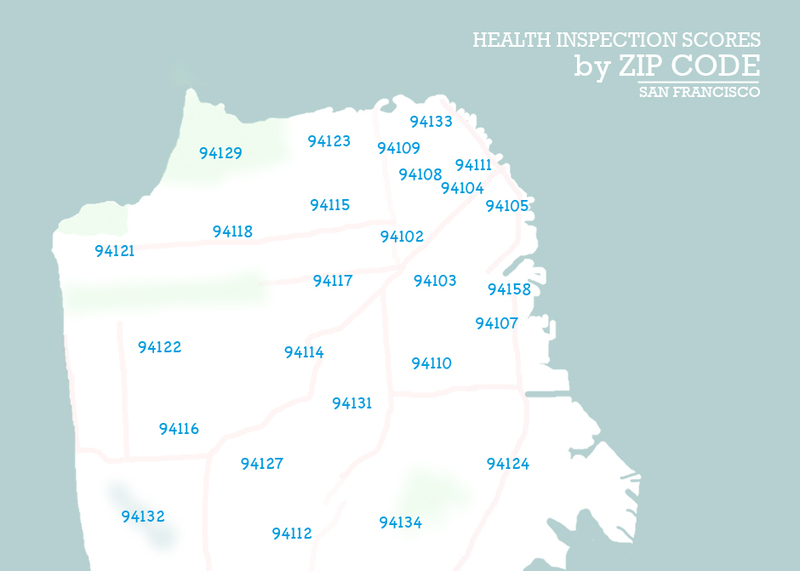 The map above covers all inspections conducted in San Francisco from September, 2009 to the start of September, 2010. For the most up to date inspection scores throughout the city, visit EveryBlock.